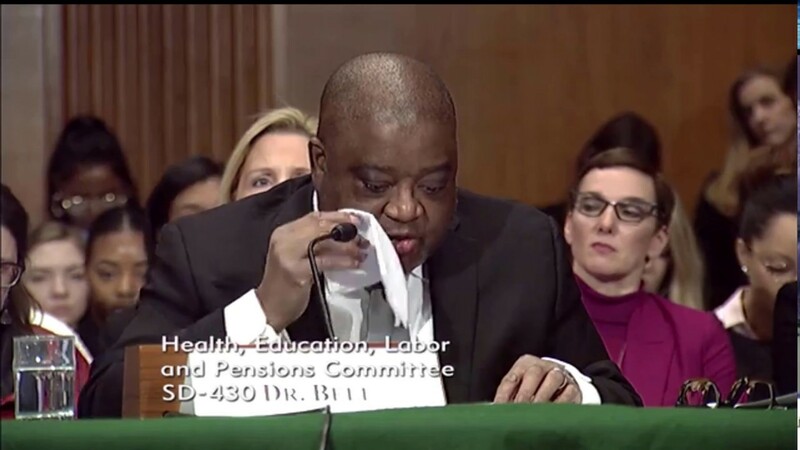 Dr. William C. Bell testified before the U.S. Senate Committee on Health, Education, Labor and Pensions on Feb. 8, 2018 regarding the nation’s opioid epidemic and its impact on children and families. He noted that parental substance abuse is a key reason that the number of children being separated from their families and placed into foster care has been increasing significantly since 2012. To help stem this crisis, Dr. Bell encouraged changes in how child welfare funds are spent to reflect an increased focus on prevention efforts. “We hear from parents, foster parents, youth, kinship caregivers, child welfare leaders and Tribes that prevention services that promote long-term sobriety, services that improve parenting capacity, and the availability of sustained services for families once children return home from foster care, are among the most important improvements that we can make,” Dr. Bell said. Good morning Chairman Alexander, Ranking Member Murray and honorable members of the committee. My name is Dr. William C. Bell and I am the President and CEO of Casey Family Programs, the nation’s largest operating foundation focused on safely reducing the need for foster care and building communities of hope for children and families across America. Casey Family Programs works in all 50 states, the District of Columbia, Puerto Rico, and the U.S. Virgin Islands, and with more than 16 tribal nations to influence long-lasting improvements to the safety and success of children, families and the communities where they live. I thank you for the opportunity to be here today to discuss the disruption and trauma the opioid crisis is causing for our children, families and communities. Data and our work with states and communities show that parental substance abuse is a key reason that the number of children being separated from their families and placed into foster care has been increasing significantly since 2012. As you’ve heard, approximately 270,000 children entered the foster care system in FY 2015. Governors, mayors, child welfare leaders, nonprofit leaders, tribal leaders across the country have been working tirelessly to overcome the challenges they face on a daily basis as they struggle to support and strengthen the families impacted by this opioid crisis. Increasingly, challenges involving recruiting foster parents, providing treatment services, treating babies born with prenatal exposure, and healing the mental trauma experienced by families have left child welfare systems strained and challenged to target resources in the best way to help families in devastated communities. There should be nothing more important to our nation than ensuring the safety of our children and ensuring that they have the opportunity to grow up surrounded by a community of hope. I applaud this Committee for its leadership and the passage of the Comprehensive Addiction and Recovery Act of 2016. Among its provisions, CARA strengthened the requirement that states have infant plans of safe care in place that address both the needs of the infant and the needs of their parents. This legislation and the Protecting Our Infants Act of 2015 make it clear that our national child and family response systems cannot continue operating as though it is possible to fully address the well-being of children without addressing the well-being of their families and their communities. Current research has found that when parents can access treatment programs on demand and can enter treatment while keeping custody of their children, they are much more successful in completing the program and, more importantly, in continuing to improve their capacity to care for their children. One such example of an intervention is Kentucky’s Sobriety Treatment and Recovery Teams program, or START, an evidence-based program that provides services to safely maintain child placement in the home and provide parents with rapid access to intensive addiction and mental health assessment and treatment. Kentucky START families have had twice the sobriety rates and half as many children in foster care as compared to their peers who did not participate in the Kentucky START program. Nationally, grandparents and other relatives are caring for more than one-third of all children who have been placed in foster care due to parental substance abuse. Research on kinship foster care tells us that children who cannot remain with their birth parents are more likely to have stable and safe childhoods when raised by relatives. Frequently relative caregivers have told us that the supports they most often need include respite care, treatment, financial support, and mental health services for individuals and family members to deal with the enormous strain that this epidemic is placing them on. But most critically, we hear from parents, foster parents, youth, kinship caregivers, child welfare leaders and Tribes that prevention services that promote long-term sobriety, services that improve parenting capacity, and the availability of sustained services for families once children return home from foster care, are among the most important improvements that we can make. But despite everything we know that works to both keep children safe and support their families, the vast majority of our federal child welfare funds support a different approach. For every $7 we spend on foster care, we spend only $1 on prevention. We must change how we spend federal child welfare funds to make sure that we are funding the efforts that are most likely to get the results that our children and their families need. We know it is important that we intervene as early as possible. States need the ability to target their existing federal resources into an array of prevention and early intervention services to keep children safe, to strengthen families, and to reduce the need for foster care whenever it is safe to do so. We also know that one of the most traumatic experiences that a child can have is to be forcefully removed from their family. In 2018, this committee will consider the reauthorization of the Child Abuse Prevention and Treatment Act. Casey Family Programs stands ready to be a resource to you and to assist this Committee in any way that we can to reduce the impact of child abuse and neglect, to increase the availability and quality of prevention programs, and to increase levels of well-being in vulnerable communities across America. In spite of all the devastation that we have witnessed and all that you’ve heard from us today, I still believe that there is hope. And I believe in the inherent power that hope brings to those in need of help. And I also believe in the power that hope brings to those of us who have chosen to be the bearers of that help. Throughout our history, when, as a nation, we’ve decided that a specific challenge confronting us as Americans had to be resolved, we have always come together and found a way to be victorious. We have found a way to overcome every challenge once we truly decided that it must be done. This epidemic is no different. This must be done. Mothers and fathers and sisters and brothers and entire communities and Tribes have cried enough tears. This must be done. This isn’t a problem for that people like Ms. Hegle or the Savage family and others in a similar situations should be left to solve on their own. All of us together must face this challenge with them as a nation united – federal, state, county, city and local communities – making sure that every child has a permanent and loving home where they can thrive and grow up to live to the fullest whatever dreams they have for themselves. Thank you very much for this opportunity to speak with you today. I am happy to answer any questions that you may have.